Does The West Coast Dominate NHL and NBA? The NBA Final and NHL’s Stanley Cup are the two most prestigious club competitions you can win when referring to Basketball and Ice-Hockey. Both sports have a similar playing format and are divided into an Eastern and Western conference, which culminate with a play-off after the regular season. This play-off starts off with 16 teams, 8 from West and 8 from East who compete to determine which side is strongest. The fact that East rhymes with least is something that newspapers and sport journals have picked up in recent years, claiming that West has been superior in NBA and NHL. However, considering all American Sports are based on a draft system, one would expect the number of titles won per conference to be evenly distributed over time. With this in mind The Stats Zone has decided to investigate the number of titles won for each conference in NHL and NBA, to see whether there is a discrepancy between what the media reports and the raw data. Since the game series are played as best of 7 matches we will investigate the most common score in the series. This gives an opportunity to see whether the game series has been particularly close, which would indicate that the difference in quality between the conferences is smaller. In the final stage we look into what seed the winning teams had, to discern if there is a trend for teams who do well in the regular season to also go on and win the play-offs. There were a few restrictions in this analysis. First of all we have decided to look at all winners in NBA and NHL since 2000 including a total of 16 seasons. Secondly it should be noted that the NHL season in 2005 was cancelled due to a lock out. This means that in this dataset, NHL consists of one season less. We acknowledge this fact but are still confident that we will be able to take appropriate conclusions from the data. 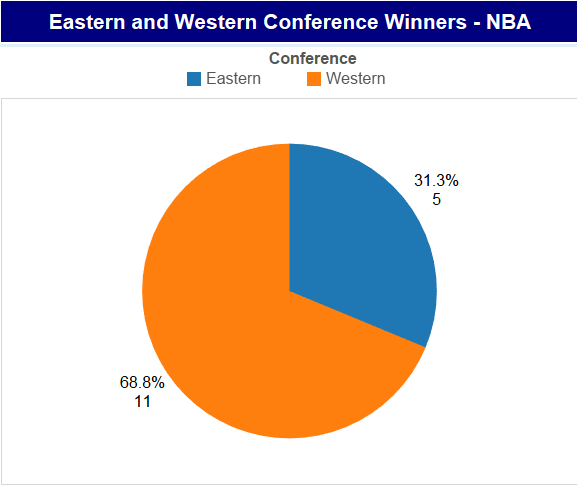 The Eastern vs. Western comparison will be illustrated in pie charts with data labels for proportion and number of times each conference has won the title. When we go on to look at the series score and seed winners we have decided to visualize this through stacked bar graphs. These graphs demonstrate the total proportion of all NHL and NBA seasons (added together), which will facilitate a comparison between the two sports. Looking at the pie chart above for NBA we can see that the Western Conference has a significantly stronger record in the last 16 years with more than 2/3 of all wins. The number below the percentage identifies the exact number of wins it represents, with the Western Conference having won the NBA finals 11 times out of the last 16 seasons (vs. 5 wins by Eastern). The graph above illustrates the frequency of each respective series score in NHL and NBA. Starting off with NBA (blue bars) we can see that the most common score is 4-2 with 19.4% or 6 finals finishing with that score. The second most common score is 4-1 with 16.1% or 5 finals finishing after 5 games. It is also interesting to point out that only 9.7% of all the NBA finals are determined in game 7 (score 4-3). Moving onto NHL we can see that 4-2 and 4-3 are the most common results with 19.4% or 6 finals finishing after either game 6 or 7. 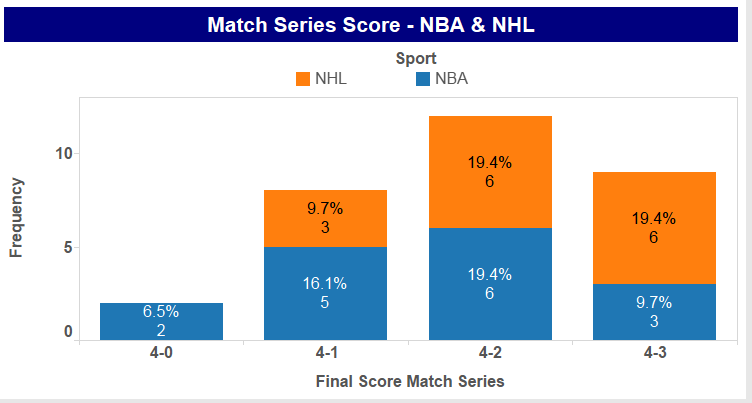 Combining these results with the conclusions taken from the previous pie charts, it seems that NHL is more even than NBA since a greater proportion of the match series get to game 6 or 7 before the winner can be crowned. The last bit of the analysis investigates the seed of the winners in NHL and NBA. Starting off with NBA (blue bars) we can see that the majority of winners have been first seed, sitting at 26.7% (or 8) of the total. Furthermore, we can see that there hasn’t been an NBA winner in the last 16 seasons that has had a seed above 3 making it unlikely for teams finishing below third in each respective conference to go on and win the NBA final. Looking at the same measure for NHL it appears that the majority of winners have been first or third seed at 16.7% and 13.3% respectively. However, there were two winners in the last 15 seasons that had seed six and eight going into the play-offs. This essentially follows the previous conclusions that NHL seems to be a more even league than NBA, with performance in the regular season not necessarily corresponding to success in the play-offs. 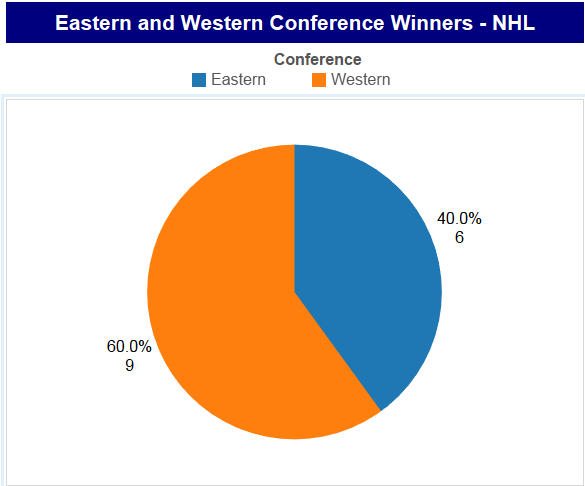 As a conclusion, in this analysis we have looked at how the performance in NHL and NBA compares between the Eastern and Western conferences. We have dug deep into the match series score data and also identified the seeding of the winning teams. Our first conclusion was that the Western conference is stronger across both sports, with NBA demonstrating the most obvious results. In comparison the NHL is a more evenly contested competition, with more games in the final being decided in game 6 or 7. Finally, there is a difference when predicting the results of both competitions by looking at performance in the regular seasons (through seed position). Whilst in NBA, those who perform well in the first stages of the competition are likely to go on to win the championships; in NHL this is less predictable, further evidence of a more open competition.